High speed Gentle Typhoons are wonderful beasties. They run at 3000, 4250 and 5400 rpm, but sound surprisingly quiet for those speeds. They draw their power from the PSU so they don’t burn out your motherboard’s fan header. They even report their RPM with a dedicated line. All they lack is PWM. With PWM control, our motherboards could tell these fans when to really crank, and when to be quiet. But take heart! Hiding in high speed Gentle Typhoons are the reins to controlling these galloping fans. I just bought a new high speed Gentle Typhoon. Inside half an hour, I can turn this wild critter into a docile PWM fan. Follow along with me, and learn for yourself. Now, I’ve already done a how-to article on converting high speed Gentle Typhoons to PWM control, but I didn’t take very good pictures. This time I documented the process. Let’s start with the fan in its box. I removed the AP-29 from its plastic outer box because that interferes with picture-taking. You can see that the retailer has sleeved it; this fan does not come sleeved from the manufacturer, or the brand seller. 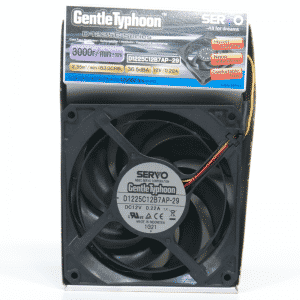 The cardboard box says this is a Servo brand, which is the same company as Japan Servo, Nidec Servo and Nidec, which in Japanese is a portmanteau of Japan Servo. The model number is D1225C12B7AP-29 Gentle Typhoon, or AP-29 to its friends (you are a friend of this fan, right?). 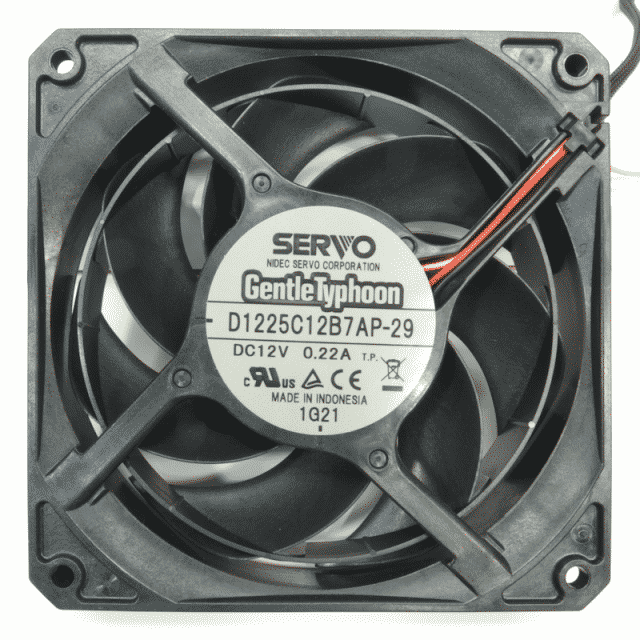 The fan carries a speed of 3000 RPM. No mention of Scythe, who markets this. You can find the name of the brand seller on the side, in rather small type. But the manufacturer’s name is all over the place. Let’s take this Gentle Typhoon out of its box and look at it. That ring is supposed to help focus the airflow, but I suspect it is there to keep the blades of the faster specimens from spreading out due to centrifugal force. For those of you with low speed GT’s; yes, there are only seven blades, not nine. It still sounds sweet. 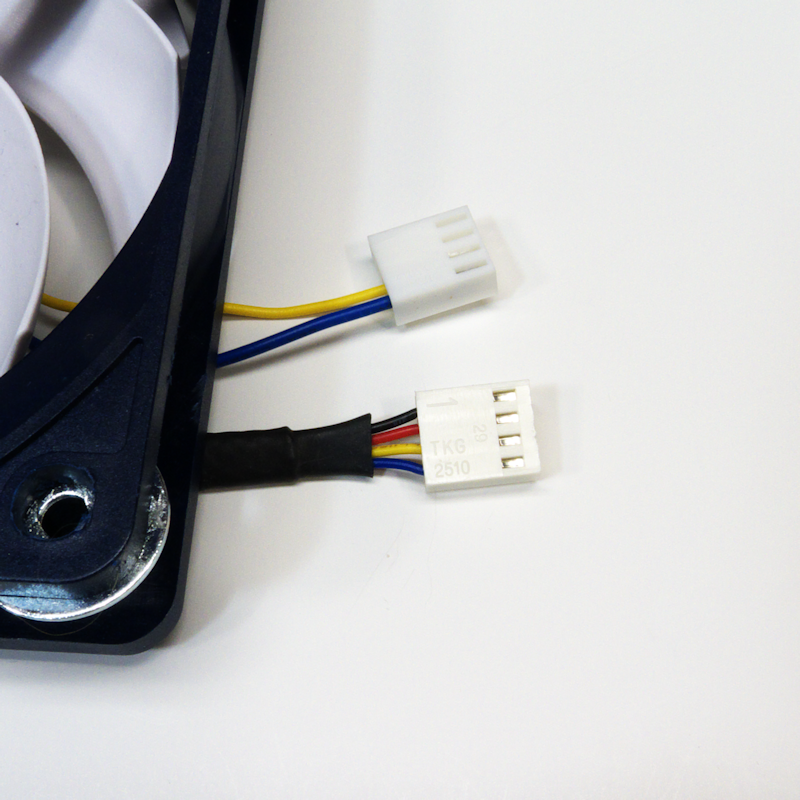 The fan comes with male and female Molex plugs for 12 V power. There is a plug at the end of the yellow wire. We’ll look at that next. This is the RPM-reporting line from the fan. As usual for Scythe fans the wire is yellow. The color has become a semi-standard. The wire connects to a three-wire plug to fit into a header on your motherboard to tell you how fast the fan is running. Now we are ready to start work. 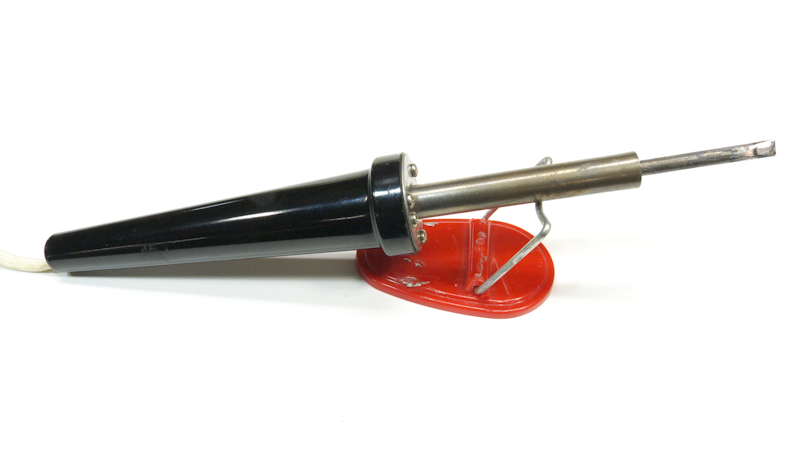 First of all we have a female crimp terminal. 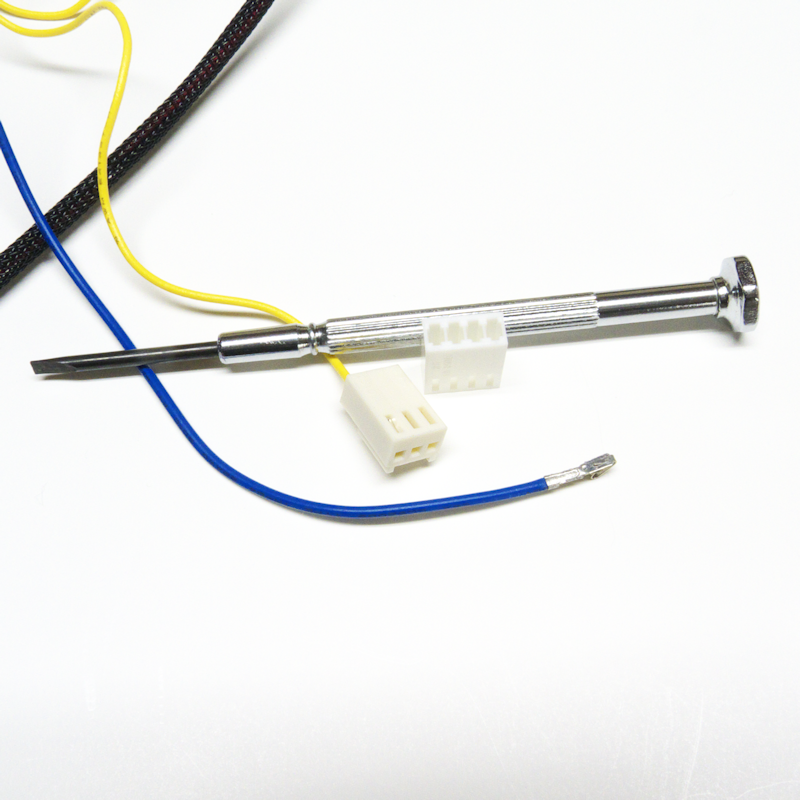 This particular one is a Molex 08-52-0123. 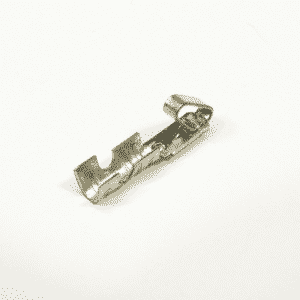 They are also available as “Female 3-Pin Fan Pins – 3 Pack.” Make sure you buy plenty of extras to practice on. You can crimp this with the expensive tool I bought. 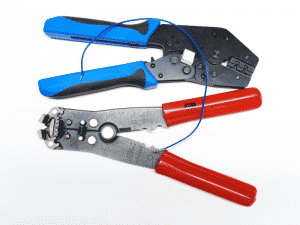 Or you can do as I used to do – crimp the terminal with needle nose pliers. You can see I have crimped the terminal to a blue wire. The lower tool is a fancy puller-type wire stripper. Ah. My trusty soldering iron. I bought this for a project in 1982. I hope you will get one with a pointy tip, but my blade tip iron does the job. 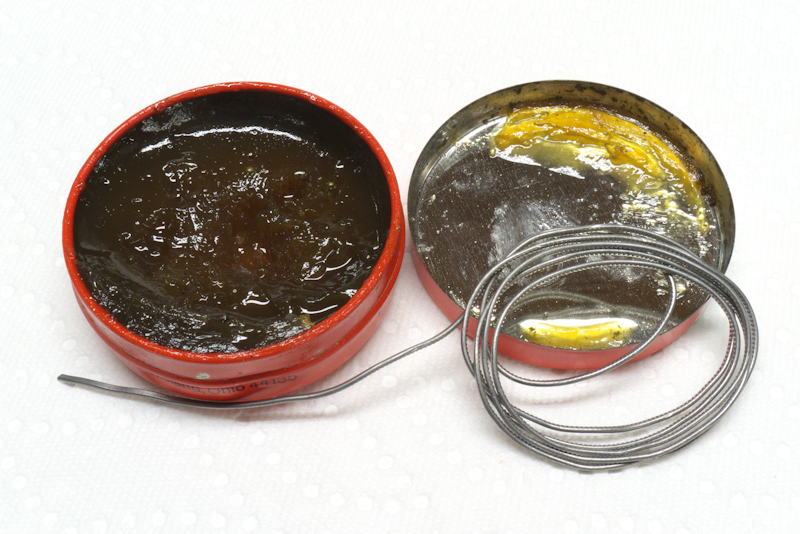 A little tin of resin. You can dip the end of your wire in it to make solder connect better. 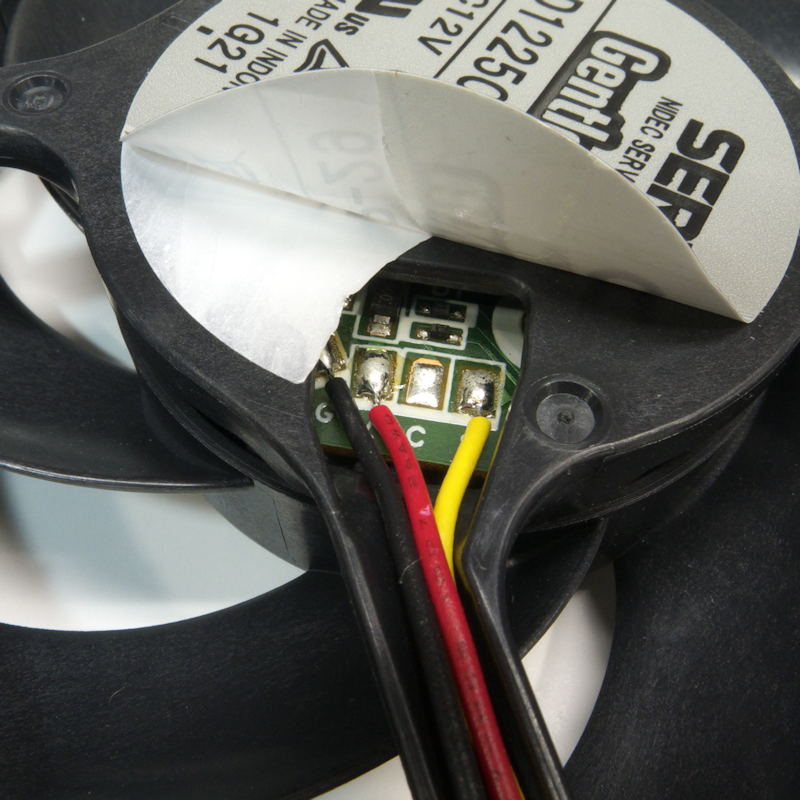 Lift the label and you can see that only three of the four solder spots have wires attached. You can’t read the labels from here, so I’ll tell you they read G-V-C-S, presumably for Ground, Voltage, Control and Speed. 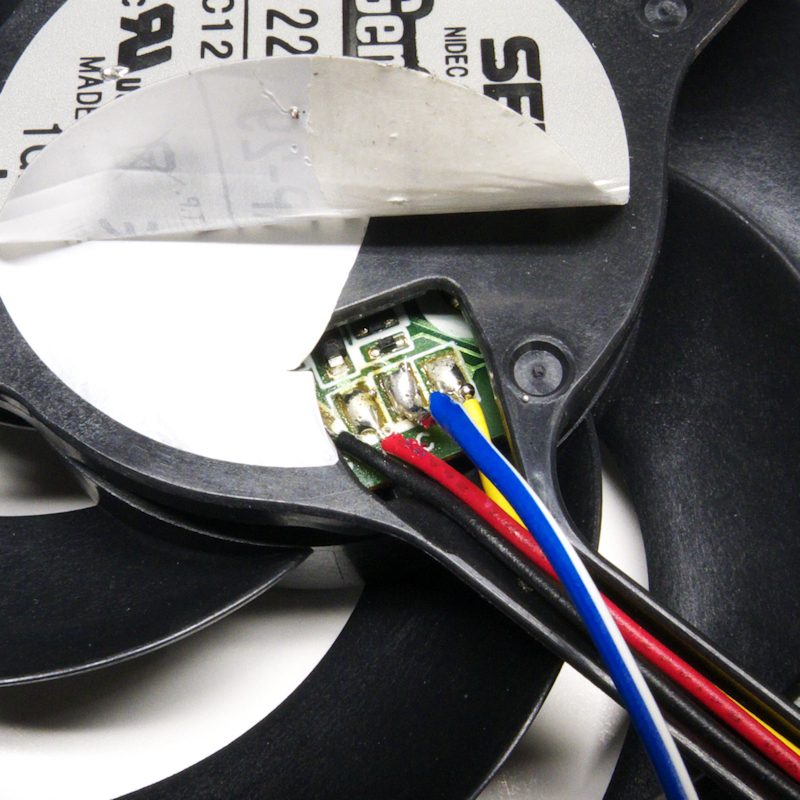 If you look at my earlier how-to, you can see that the order of the wires is different between the two fans. The part that takes practice is not something I can show on camera. Suffice to say I am rusty enough that getting the end of a wire soldered onto a little tiny patch in a small opening took several tries to get it right. Luckily a hot iron will let you try lots of times. And in the end, the blue wire is now electrically and mechanically attached to the fan’s PCB. Now let us compare the two plugs – a.k.a. “crimp housings.” Three wires – gnd, 12v and RPM, with only the RPM position populated – and four wires, all empty as yet. The miniature screwdriver is there to press on the crimp terminal’s tab. While pressing on the tab with one hand, you gently pull on the yellow wire with the other, and draw it out of the plug housing. Then you push the terminals into the plug housing. The picture shows you where the wires go. 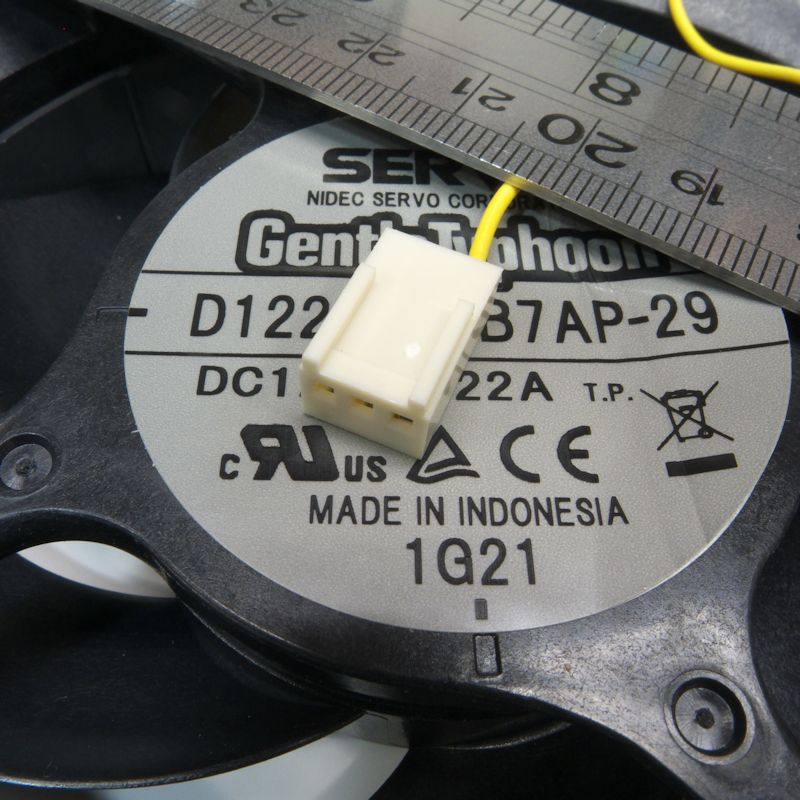 For comparison there is a PWM fan’s plug. The fan uses the same wire colors as we do, so it’s a straightforward comparison. You can see the black and red wires that carry the ground and 12-Volt current to the other fan, with the yellow wire reporting RPM and the blue wire carrying the 5v PWM control signal. What I especially like about this picture is that you can see the tabs you must press to release a terminal from the housing. AP-29, all done! Using my PWM Mate I indeed was able to run the speed of this fan smoothly up and down. At 100% PWM duty (pure 12v) it runs 3050 RPM. When I ground the fourth wire (equivalent to 0% PWM duty) it runs 1215 RPM. Now that is a nice speed range. The only downside to this is that the project was over so quickly. It almost took me longer to scrounge around for the right scrap of blue wire than it took me to crimp it, solder it and pop it in the plug. But it was nice to have an excuse to get out some tools and play with them. I use this mod too. totally worth it!! wow, that is simple! figured it would be something more complicated, than that. Great guide! 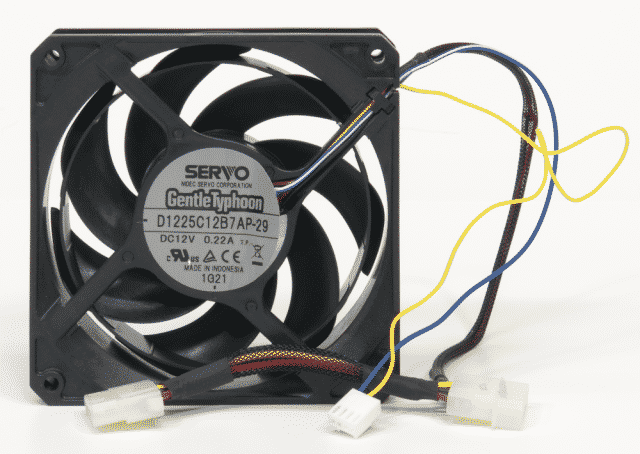 perf pcs is selling a pwm version of this fan with a normal 4pin pwm connector (no molex). 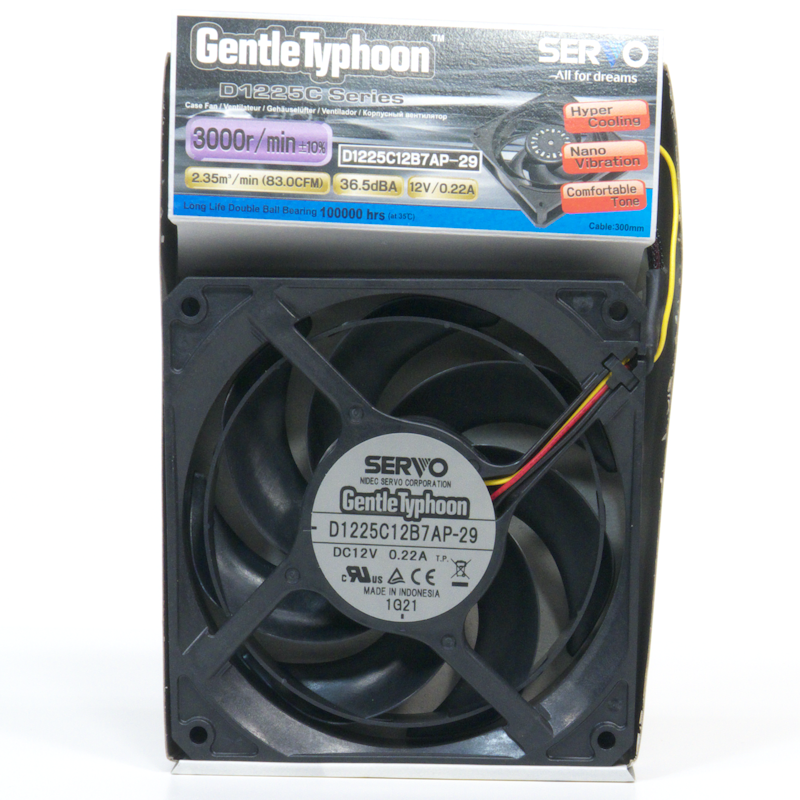 I am wondering if it is safe to power this fan from my mobo (maximus v formula). I think my cpu header is rated at max 1A or 12watts. I know this fan has a starting current of .97A which would be 11.64 watts. Also wondering if my cpu opt. 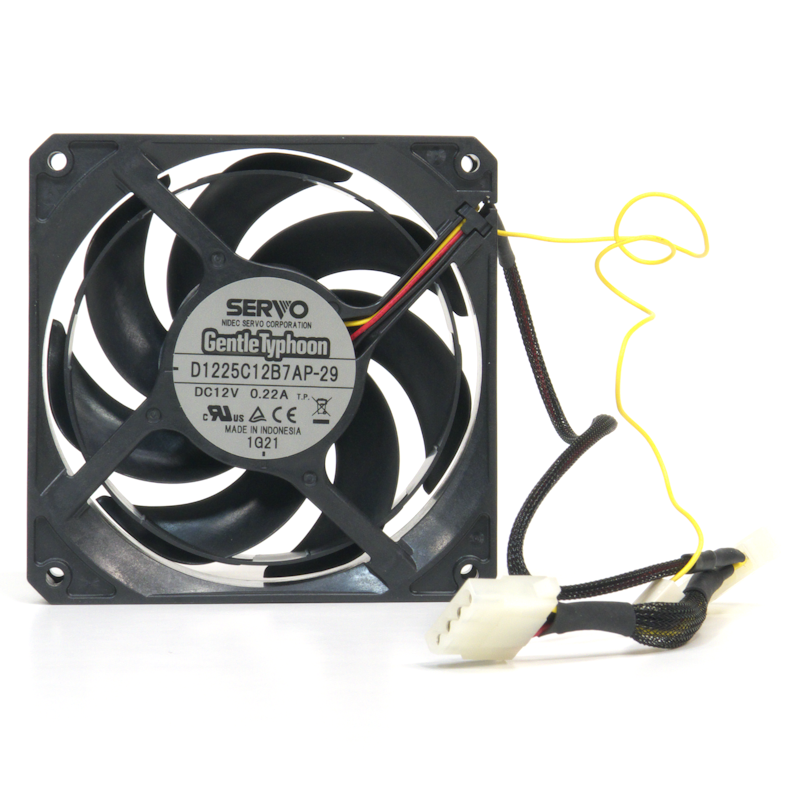 fan header has its own 1A -12watt power or shares power with my main cpu header in case I wanted to power a pair of these directly from my motherboard??? Thank you! very interesting. I want to replace the Antec stock fans in my Antec Kuhler 920 and these are a perfect choice. BUT I've done all the modifications, my fan work but are not managed by the kuhler chill software nor their speed is displayed. I did my connection in 2 ways: 1) I took 4 pins connector and cable from a PWM fan and did all the welding accordingly. Fans spins but no control or info about the speed. 2) I kept the original molex connector, removed the yellow cable (speed info) and welded the 2 cables (yellow and blue cables only) from the 4pin connector I had used previously . Still no luck, same result. So I'm wondering if Antek Kuhler chill control soft is just not able to use / read from a 3000 rpm fan? How could I check that my fan is sffectively PWM without using the Chill control software? Did anyone here had sucess in using those fans with the Antec Kuhler 920? BTW I find it crazy , with the rise of water cooling, that no company produces PWM quiet fans over 2000 rpm. I have some pumps without pwm. I want to make like the post. Is there any one can make it with SC600 or any pump with resistor controller. No mention was made of where to get the four pin female plug where the blue and yellow wires migrate to. Hopefully, there is a source for them so you don't have to canabalize another PWM fan just to get one. Here is one source. Computer retailers sell them in smaller lots. 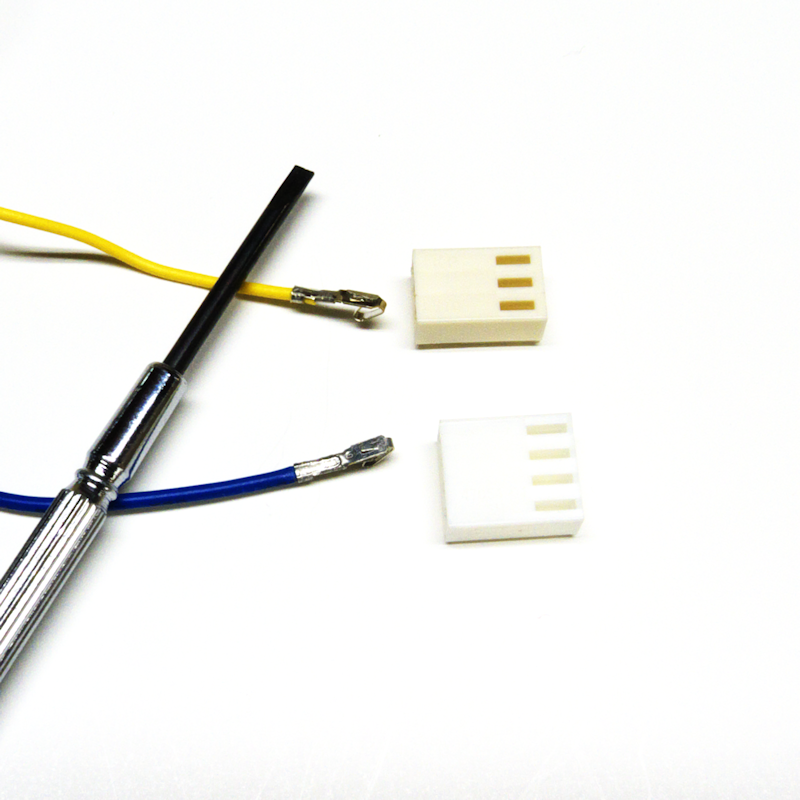 They are variously called 4-pin or PWM plug housings.